Ipswitch WhatsUp Gold has been going from strength to strength since its reinvention in 2017; and given the feedback from our webinar viewers, this version is not going to disappoint. Here is a sample of what is new in the 2019 edition. For a full list of all new features, bug fixes and other information, make sure to take a look at the releases notes over at https://docs.ipswitch.com. You would be forgiven for thinking that the application profile monitoring module in WhatsUp Gold was created by a different team or absorbed into the solution as part of an acquisition. It always looked a little different from the rest of the administration console. 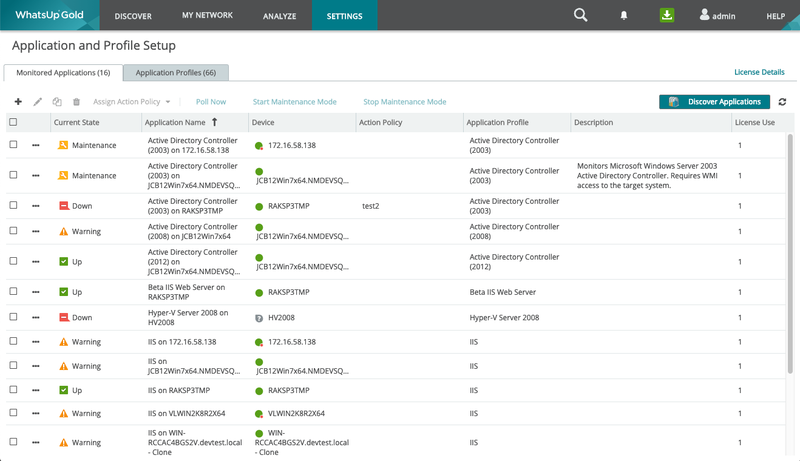 As one of Ipswitch's most requested enhancements, the application profile monitoring interface has now been re-worked to better fit into the wider console. For those who already use the application monitoring module, the module itself retains its same functionality, being able to test various components of an application for an overall indication of health, albeit with some elements being moved around. One of the most common items of feedback from the Ipswitch user community is that there is a sense of blindness for WhatsUp Gold Administrators when buttons are pressed in the administration console. It is assumed that polling is happening as instructed and that when buttons are pressed but what is happening between instruction and result? To counter this, Ipswitch have added the live monitor view, which provides updates on a bar at the bottom of the screen related to the applications activity. This bar is can be clicked to open a report which provides further detail and filtering capabilities. Versions prior to 2019 has a significant blind spot in the monitoring of the WhatsUp Gold solution itself, making this a very welcomed addition to the solution. If you are new to WhatsUp Gold, there are two types of network map available for WhatsUp Gold users. An automatically generated map which places network devices, servers and other devices in a logical order based on their connections to other devices in the network. A customisable map which builds on the auto-generated map by allowing the movement of device icons, annotations and image overlays. In WhatsUp Gold 2019, a greater level of customisation has been added to the custom maps, so that WhatsUp Gold administrators can enjoy a view which they prefer. Displaying device names in uppercase characters. 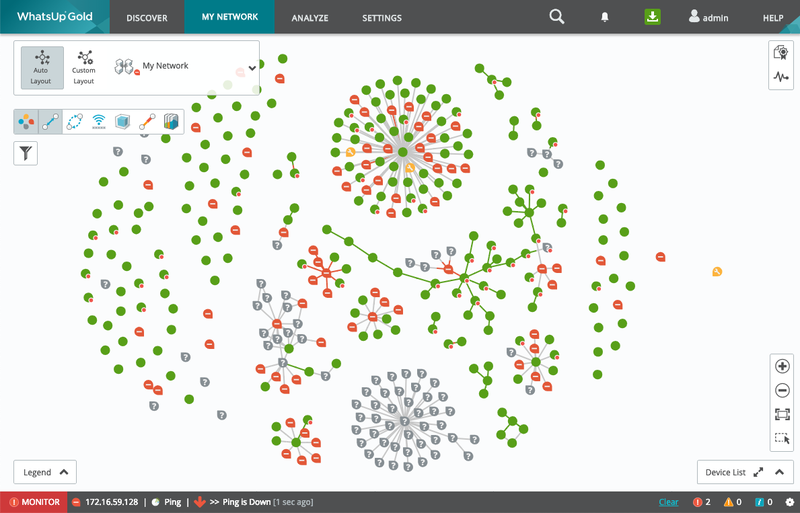 Building on from previous Network Traffic Analysis additions. The module now accepts known bad hosts feeds which in turn can be used to flag suspicious activity. WhatsUp Gold has long been a network monitoring tool, only really broaching the security sphere from the perspective of availability. This marks not the beginning of a new focus but one which has been building since the 2018 edition, when the ability to detect traffic originating or being sent to the dark web was added. Continuing the theme of enhancements to additional modules, the configuration management module has also seen some enhancement. For those who are not familiar with it, the configuration management module provides a number of interactable features with network devices. Such as being able to store multiple copies of the running configuration file over a period of time, for comparison. 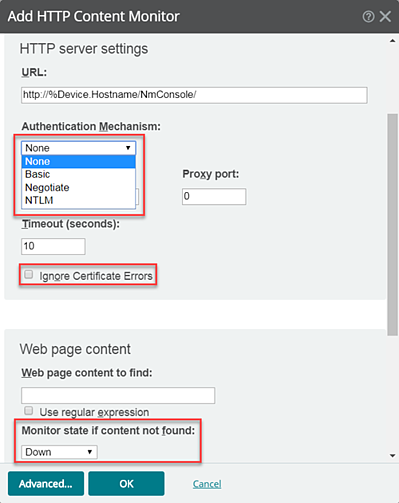 In previous versions, only configurations from the same device could be compared using the device properties menu. Now there is a configuration archive where all backed-up configuration files can be viewed and compared in a pool. To roll things up nicely, the HTTP monitor has had a bit of an upgrade in 2019. In previous versions of WhatsUp Gold, the HTTP monitor could have been accused of being a little unintelligent. Pretty much just a probe. In 2019, some intelligence has been added to this by allow authentication. In effect, WhatsUp Gold can now test the authentication process as well as the response code from a URL. As well as the new features and enhancements listed in this blog post, there are other lesser changes and bug fixes which are applied in the 2019 edition. Are you a user of WhatsUp Gold and want to learn more about the 2019 edition? Maybe you are interested in a network monitoring solution and would like to see more of what can be achieved with WhatsUp Gold. In either case, you can book a call with one of our solution specialists here.